Like blogging, I am late to join the party when it comes to Guitar Hero. Today we made it down to Richmond to visit my mom and step dad for an early Christmas and my Mom stepped up to the plate and got me Guitar Hero World Tour for the Wii. 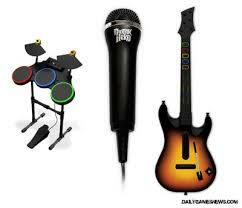 Not just the regular game but the full band set with guitar, drums and a microphone. The box itself could fit a small child comfortably and after assembling the drums and guitar, I was ready to go. I started with a few songs and played horribly on guitar. I found drums a little easier and vocals very easy (although my Mom's ears are probably still bleeding). Later in the evening, I was able to play with Lori. We took turns on guitar and drums and actually rocked out real good on "Today" by Smashing Pumpkins (one of my favorite songs by the way). I managed to hit the first 115 notes on drums in that song but realize I'm playing on easy level. I'm just not ready for medium anytime soon (I'm sure Doe will hate on me for that). All in all the game is just as advertised and I imagine becoming very addicted to improving my performance. It looks like only about 30 percent of the songs are unlocked at first so I'm sure unlocking songs will be a nice incentive. I'm going to try to bring it all with me when we go up north to Jersey next week so we can have a few jam sessions with my sister-in-law and her boyfriend (I imagine the game will be way over the heads of my in-laws). Thanks for a great gift Mom! Four words: Beat It, Jessie's Girl. Get up to speed on medium. Three buttons just isn't much of a challenge.